Tony Eufinger is an attorney at law and the founder and owner of Eufinger Law Offices, LLC located at 214 South Court Street in Marysville. He graduated with honors from Capital University Law School with a Juris Doctorate in 2009 and from Ohio University with a Bachelor of Arts in Journalism in 1999. 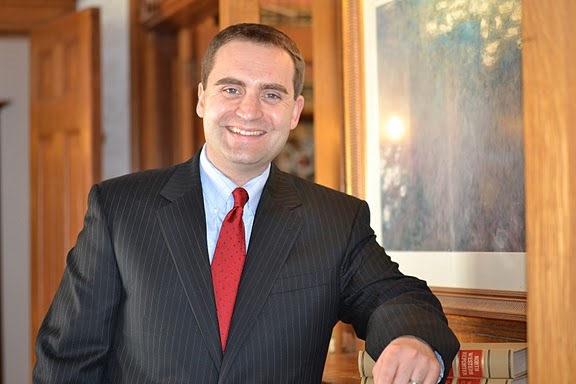 Tony focuses his practice on estate planning for families and individuals. This includes drafting wills, trusts and powers of attorney as well as preparing strategies for avoiding probate and maximizing the benefits of individual estate plans. Tony concentrates on other probate matters including will and trust contests, estate and trust administration, and establishing and maintaining guardianships. In addition to the estate planning practice, the attorneys of Eufinger Law Offices, LLC represent numerous personal injury clients in such matters as automobile accidents, premises liability, and wrongful death claims. They perform work in real estate matters including contract negotiations, foreclosure defense, landlord tenant law, and title work and real estate closings. Tony is a licensed title agent and the President and CEO of the Heart of Ohio Title Company. Other associates handle domestic relations cases including divorce, dissolution and custody matters. Tony serves as the village solicitor for Milford Center, and is a former Assistant Marysville City Prosecutor. Tony is the third generation of his family to practice law in Union County, following his late grandfather William L. Coleman, a former Union County Prosecuting Attorney; his parents the Honorable Judge Charlotte Coleman Eufinger of the Union County Probate and Juvenile Court and John M. Eufinger, a retired magistrate in the Delaware County Juvenile Court; and his uncle Stephen G. Coleman. For the last two years, Eufinger Law Offices, LLC won the Marysville Journal Tribune’s Readers’ Choice Award as the favorite law firm in Union County. Prior to practicing law, Tony worked overseas in London, England for ABC News as an assignment editor, assistant producer and abcnews.com writer where he received a Peabody Award for his contributions to ABC News’ coverage of the September 11, 2011 terrorist attacks. He has previously worked in public and community relations, including two years for the Marysville School District where he helped administer a digital charter school. Tony and his wife Megan Mattison Eufinger live in Marysville with their daughter Kate. They are active volunteers with the United Way of Union County and with the First Congregational United Church of Christ in Marysville.